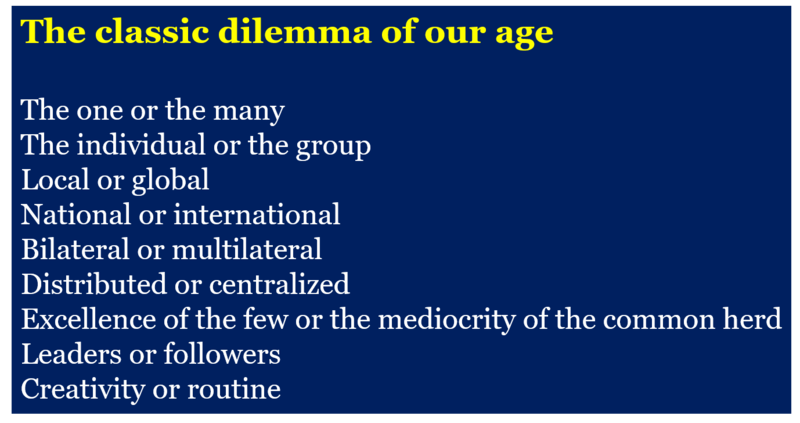 It is the classic dilemma of our age which shows up everywhere. I nearly always tend towards prioritising the one primarily because without the one there cannot be the many, without the local you cannot get to global, without the national there is no international and without the excellence of the few you cannot get the good of the herd. I prefer the highest multiple possible to the lowest common factor. It colours my politics. I prefer the search for excellence rather than the common mediocrity of socialism. I prefer the the internationalism which comes as a consequence of strong nationalism to the bullying of the UN or the EU. I side with “to each as he deserves” rather than to “each as he desires”. Freedoms flow bottom up from the individual to the group rather than privileges and sanctions flowing from the group down to the oppressed individual. This entry was posted on October 31, 2017 at 4:07 pm and is filed under Anthropology, Behaviour, Politics. You can follow any responses to this entry through the RSS 2.0 feed. Both comments and pings are currently closed.